If more than two developers work together on the same project for a while, nobody ever says that code quality is good enough. Developers are very often unhappy with their application code quality. Very often those judgments are subjective and are not proven by data. And what does it exactly mean – “code quality”? If an application has no bugs, can we say that it has low quality? And those characteristics can be measured. Moreover, we can measure them automatically, and we can include this measurement process into our build process. Continuous Inspection is a new approach to code quality management. It helps to make software quality measurement a part of the software development lifecycle. The key concept in Continuous Inspection is finding problems early. In this case, it would be easy and cheap to fix them. Automated code audits can be performed daily or might become a step in your continuous integration pipeline. Quality improvements of code produced by increasing developer knowledge and understanding of code quality issues. Reducing maintenance cost through early identification of quality issues. SONAR is an open source web application to manage code quality. 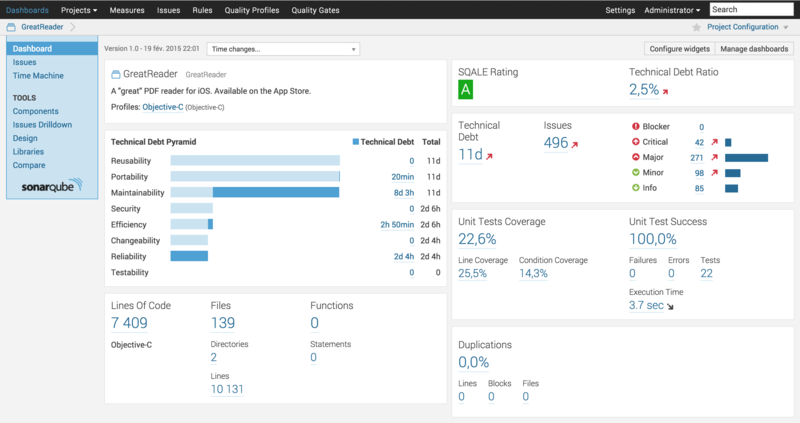 Unfortunately, SonarQube plugins for Objective C and for Swift cost a fortune.